Rebel Wilson took the comedy world by storm and won everyone over with her don't give a damn unapologetic fat awesomeness, She has worn what she likes and worked it all around Hollywood, Living up to her name and giving so many women a high 5 they have been looking for, Here are 5 times she looked killer and caught the worlds eye. It came as no surprise when Torrid announced they would be working with Rebel on a clothing line which is now live on their site. As Torrid is a US store these items are only available on that side of the world but since when have we let that stop us? In total there are 21 items ranging from dresses, jackets, tops and skirts. I have picked out a few of my favourites to share with you. I am really feeling the spring vibe from this really pretty powder blue skater dress which has super cute lace style detailing. Teamed with the white faux leather jacket this would make the perfect daytime Spring outfit. I grew up on country so am a sucker for a bit of denim and I really feel like this outfit has a real country girl feel to it. I can wear white skirts but I dig this combo and like the shape. 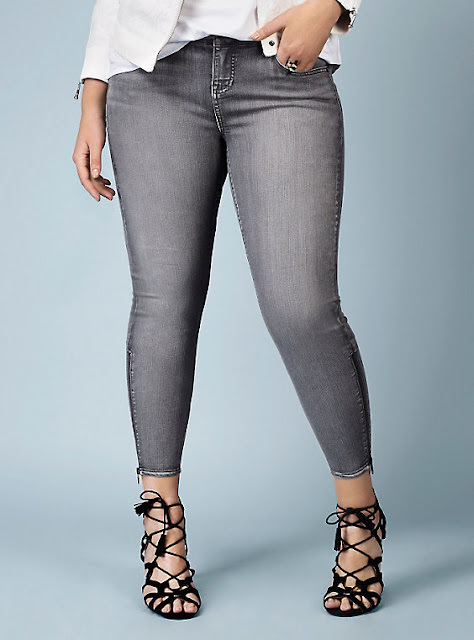 Skinny jeans are a staple in most girls wardrobes and if you haven't snagged yourself a pair yet then get to it. Grays are really coming in this season and I think they go lovely with blues and whites for spring time. Out of all the line my favourite has to be this skirt and crop top combo. Really cute heart pattern detailing and it looks super comfy and wearable. Over all the rebel Wilson line is very feminine and pretty playing with different shapes. I do think it almost is still a little too safe but I could see Rebel wearing these items which when a celebrity endorses something you really sang to have a taste of their style in the line. I look forward to seeing if there will be another range which hopefully will be a bit more daring. What do you think of the new Rebel Wilson clothing collaboration with Torrid? What do you think of the Rebel Wilson collection? That white skirt!!!!! Praying there's a Torrid store stocking this in San Francisco next month! I am loving that blue dress! Gorgeous clothes! I love the grey skinny jeans, the powder blue skater dress is pretty cool and could be dressed up or down which I love. I love the denim shirt and white pencil skirt combo. Lusting after that outfit! Absolutely love them all! Especially that powder blue dress! The collection is lovely and they all have a lovely cut I love the white jacket. She's an absolute beaut and is rocking those outfits. They're not clothes I'd wear - too girly for my tastes, but she looks great. I think it is fantastic. Love the designs a lot. The matching skirt and crop top is my favourite but I don't know if I could pull the look off myself!